In 2017 I was invited to take part in an exhibition at Messums Wiltshire (above), a magnificent tythe barn dating back to 1296. Not having anything of the right scale for somewhere like this I decided to quickly make a new piece, something that I had in mind but which needed an opportunity like this to become realised. My idea was to make something that would blur the line between furniture and sculpture. Using kitchen wall cupboard technology, the piece has sliding panels painted in different colours, which viewers can move if they wish. Originally designed to be a long plywood box raised on trestles, the space I was offered when I went down to set up was in front of a long white wall at the end of the gallery. Johnny Messum was there and said to me - why don't you just hang it on the wall? The wall was such a perfect fit that I did, and I think it looked much better shown in this way. 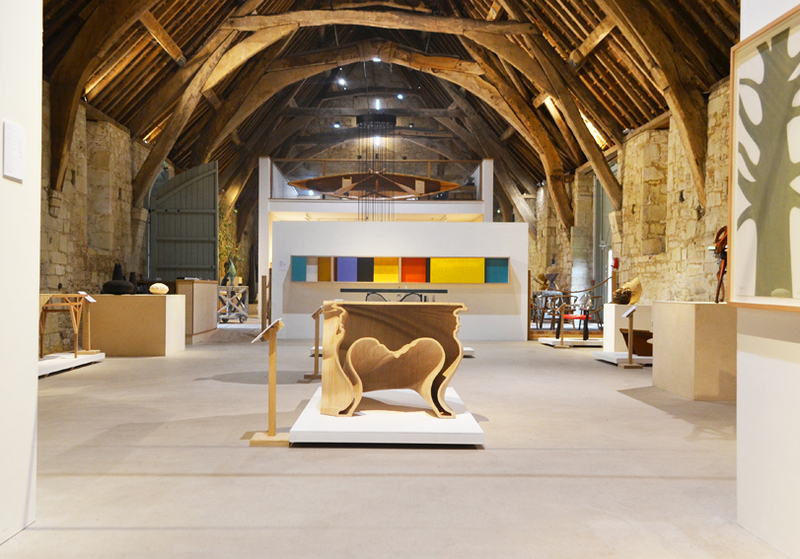 The theme of the show was 'Wood - Design and Inspiration' and included among others : Grant Aston, Fred Baier, Sebastian Cox, Thomas Heatherwick, Luke Hope, Eleanor Lakelin, John Makepeace, David Nash, Petter Southall, Wycliffe Stutchbury, Gareth Neal, William Warren and Nic Webb.